Tekst Unique. Spider. May be played as a hazard creature (with two strikes) or as a permanent-event. As a creature, she may be played at Dol Guldur and The Sulfur-deeps. If Doors of Night is in play, she may also be keyed to Southern Mirkwood, Heart of Mirkwood, or Woodland Realm; or at any adjacent site of The Sulfur-deeps. If played as a permanent-event, all Spider attacks receive +1 strike. 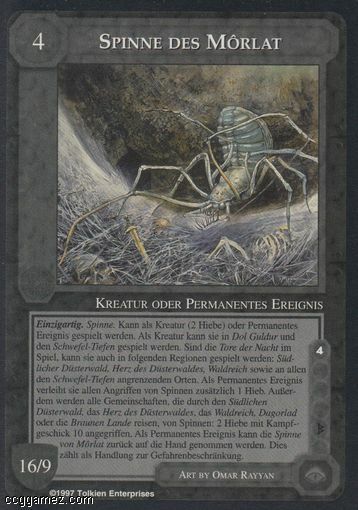 Additionally, any company moving in Southern Mirkwood, Heart of Mirkwood, Woodland Realm, Dagorlad, or Brown Lands faces a Spider attack of 2 strikes with 10 prowess. You can return Spider of the Môrlat as a permanent-event to your hand-which counts as one against the hazard limit.